A lot of photographer’s have asked me recently many questions with regard to the Olympus OM-D-5. How good is it and how do the photo’s you take compare with your current camera. Well simply put: nothing will replace my full-frame Nikon Camera and Lenses. However having said that there are going to be numerous times I don’t wish to carry heavy gear and having a lightweight alternative makes a lot of sense. I am doing some long hikes now and some of these will run into multi-day ones, and there is no way I am going to carry heavier gear. The Olympus OM-D-5 is a marvel of engineering and precision. I am completely astounded at the quality of the images it can produce. Bear in mind that its the way you use this camera that will give you the desired results and the worst thing you can do is treat it like a compact camera. This machine is far far ahead of that! In the following examples I show you what it can do. The first image below is a copy from the Latest Digital Photography magazine (Issue 31) just out on the Newsagents stands this week. 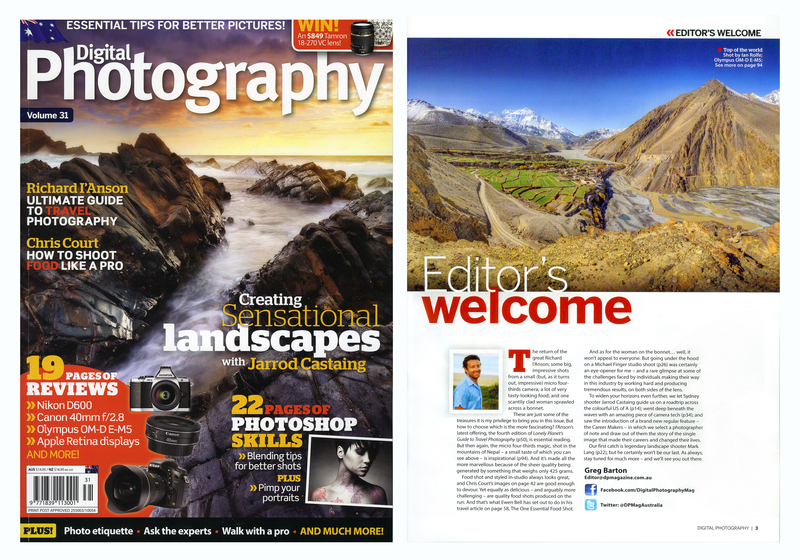 In the Editor’s Welcome an image of mine has been used from Nepal. This image is a 3 shot vertical using the 9-18mm zoom. I used 25% overlap and shot 2 images of each 1 with 2 stop under-exposure and one with 1/3 stop under. the two images were merged in photoshop individually and then the final images was created. Readers of my blog will be aware that I have already inserted the copy of the 4 page article on the camera, but if you want to buy and keep the magazine and refer to the article its on pages 94 to 97. In the next photo below I have an example of extreme contrast in a rainforest setting. Again I am amazed at what the Olympus can do! 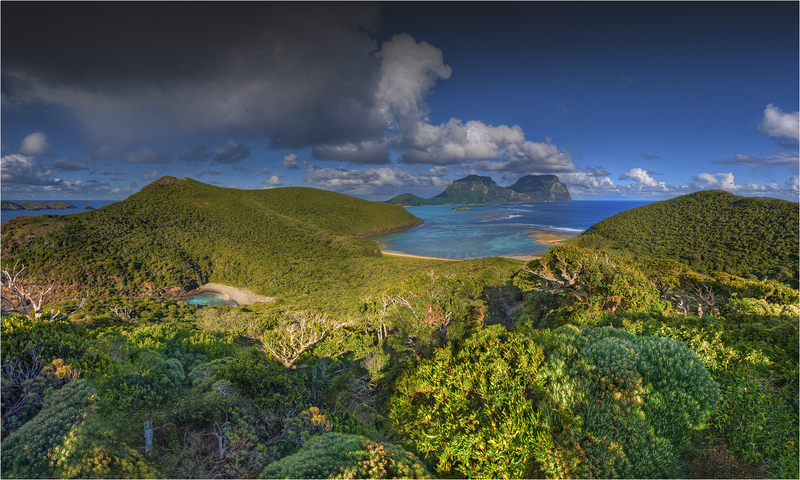 On Lord Howe Island there are large pockets of rainforest and within this are stands of Pandanus. I took this photo after quite a long walk and the sun was nearly full overhead with extreme contrast. I hand held the camera and took a set of 5 images @F9 to eventually form a panorama once I got all the images into the computer. Each set of images were exposed 3 times. One at 2 and 1/3 under exposed One at 1/3 under exposed and One at 1/3 over exposed. Each set 0f 3 images were merged in Photo-matix Pro and the default tone-mapping was left on. Using the 5 finished images I then stitched/merged in Photoshop using the reposition setting. the photo was tweaked in Nik software using structure/saturation/sharpening. The finished photograph is 18 inches by 30 inches and is quite superb in quality. The details in the photo are excellent and its sharp front to back. In the image below is another very tricky lighting situation. 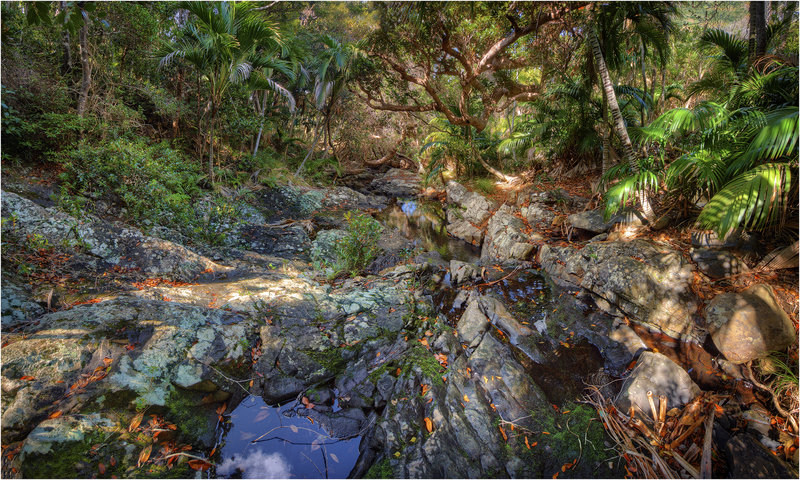 This is a little stream near the Rocky run on the far side of Lord Howe Island. This spot is in the rainforest too and the light was again very contrasty. I shot hand-held @F8 exposing a set of 4 images each one with 2 exposures One at 2 stops under and One at a 1/3 underexposed. The two images from each sequence were merged in layers in CS6 and once finished were stitched in Photoshop using the reposition setting. Not strictly a panorama, but I wanted to capture the entire scene so therefore the need to take all the images. A few more tweaks in Nik software to get the lighting, Structure and sharpening just right I ended up with an image 15 inches x 25 inches of incredible high quality and also incredibly sharp, showing off the vast detail in this rainforest setting. I deliberately set out to find a difficult and challenging setting to work the Olympus OM-D-5 and put it through its paces. It has come up trumps and I would have no hesitation recommending it to anyone. If you click on any of these images, I have downloaded them in a slightly higher resolution than I normally would, so anyone can see the quality on their computer screen. Finally, the image below is a five photo merge and it was taken after a quick dash up Mount Eliza and shot while catching my breath, hand held and with at least 30% lap on each image. Finished in Photo-shop and tweaked up. Late afternoon light helped of course…But here the Olympus did the job extremely well, and no heavy load on this walk to slow me down.I sincerely hope this little exercise has helped answer the many questions I have been asked recently. This is not a paid ad for Olympus but I have used Olympus camera’s in the past, especially in the film days. There are a lot of small camera’s out there that just do not come up to the mark…. But the OM-D-5 is not one of them. Its my backup camera and will be in my bag on all my travels.